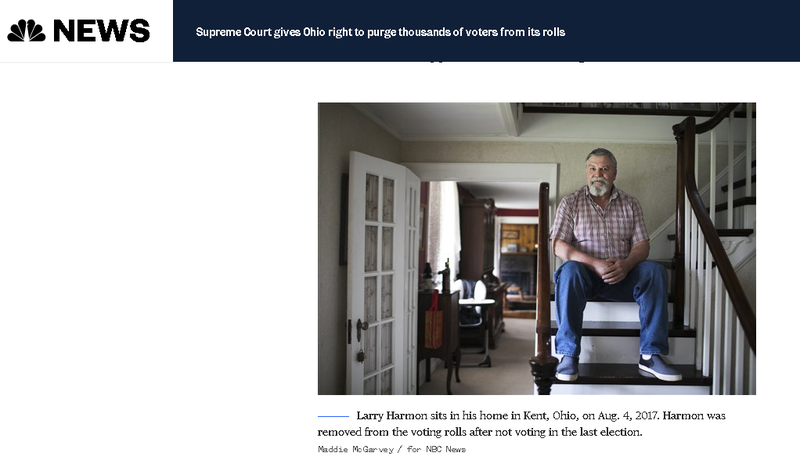 The Supreme Court ruled this week that Ohio can continue its "use it or lose it" practice of cleansing voter registration roles of the names of thsoe who have not voted in two consecutive elections. The practice created confusion for many who showed up to vote only to find they their registration had been revoked and adds a new, addministrative barrier to voter participation. Advocates for the procedure claim it's needed to prevent voter fraud, though there is not evidence to support the claim (Read MCF Giving Forum, "The Myth of Voter Fraud"). Concerns are the practice will exend to other states, resulting in voter suppression, particularly in communities of color, among young and older voters and in lower income communities. NBC reports. Washington Post describes the Court's decision, itslikely impact and opines that it may now be legal but it doesn't make it right. MCF conference keynoter, Ari Berman, reports the story in Mother Jones and ties the action to the history of partisan voting rights suppression addressed in his MCF conference remarks and his book, Give Us the Ballot. A commentary in The Nation does the same. MCF opposes the Trump Administration's actions on the census as they run counter to our policy commitment to promoting prosperity through inclusion and equity by strengthening democratic systems and civic engagement, including support for voting policies and practices that expand access for all eligible voters.